Russian helicopter pilots are the best on the planet once again! 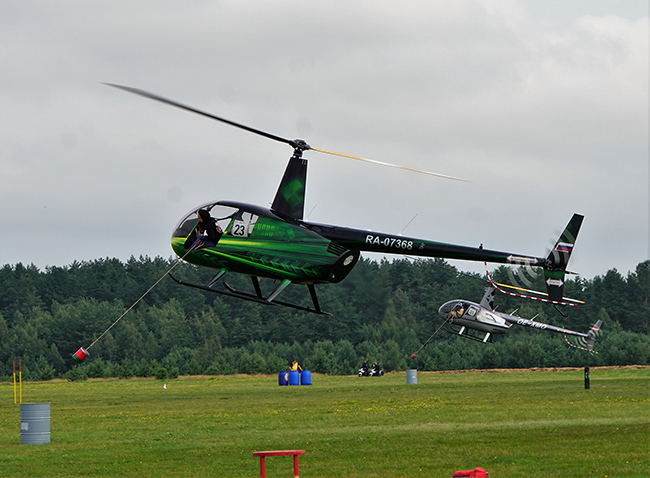 On July 24-28, 2018, Borovaya airfield near Minsk became the site for the decisive battles of the world helicopter championship - the 16th FAI World Championship in helicopter sport. Over the past 26 years, the Russian team has remained the undisputed leader of the world championship. 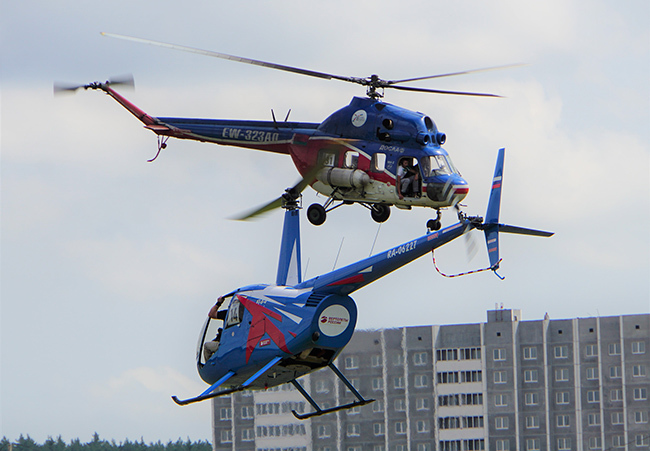 Following Russia, Great Britain and Poland hostess of the fourth, final stage of the World Cup in helicopter racing was Belarus. The competitions were open to the audience, who saw the entire colour of the world elite helicopter sport at their native airport. For their part, foreign guests appreciated the level of the organisation of the competitions and the unique atmosphere that our Belarusian colleagues could create. In addition to the competition itself took place the 4th Aviation Festival #ProNebo. It is a celebration of aviation, with demonstration flights and paratroopers performances, an exhibition of aviation equipment and an entertainment program. There were surprises and even curiosities: at the opening of the competitions was noticed an outstanding Norwegian biathlete Ule Einar Bjoerndalen, a well-known Russian TV presenter Leonid Yakubovich, to the surprise of the festival guests, performed aerobatics figures, and the Chinese team lost its way on the route and returned to the airfield and never having fulfilled the task. 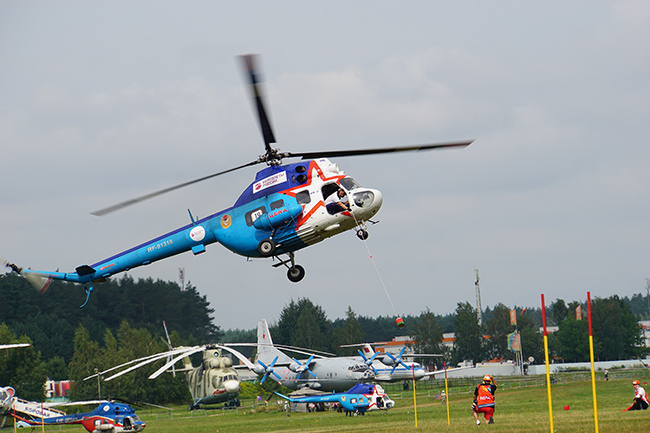 In the World Championship, or, as it is also called, the helicopter mundiale, 34 crews from 7 countries of the world took part: Austria, Belarus, Germany, China, Poland, Russia, Ukraine. The competition was judged by an international team led by the International category judge from Germany Lothar Oler, and his deputy was Olga Sheveleva from Belarus. The international jury for the first time consisted entirely of women: under the leadership of Irina Grushina from Russia worked Nicole Brenda of Britain and Canadian expert Mary-Anne Stevens. Athletes on Mi-2 and R-44 helicopters competed in four main disciplines: Navigation, Flight for Accuracy, Freight Handling and Slalom, which resulted in a personal-team championship. Once again, the top step of the command pedestal was determined without intrigue: Russian pilots won the highest scores in the team event (3,559.8 points) and won many prizes in all major disciplines. The hosts of the competitions showed themselves well: the Belarusian team became the silver medalist of the World Championship in the team event (3,477.1 points), besides, on the account of the Belarusians the awards in separate exercises and individual championship. The bronze of the Championship went to the Polish team (3,334.3 points). Absolute World Champions - Maxim Sotnikov and Oleg Puodzhukas (Russia). In the second place, the Russian crew in the composition of Andrei Orekhov and Vadim Sazonov. The Belarusian crew - Alexei Mochansky and Anton Danchenko - became bronze medalists. World champions in the exercise "Navigation" was the Polish crew Marcin and Michal Shamborski. The silver prizes were Viktor Korotaev and Vladimir Zyablikov from Russia. Bronze went to their teammates Andrei Orekhov and Vadim Sazonov. The whole pedestal of honor for the exercise "Flight for accuracy" was occupied by Russian crews. The world champions were Andrey Orekhov and Vadim Sazonov, in second place Sotnikov Maxim and Oleg Puodjukas, on the 3rd - Yuri Yablokov and Konstantin Podoynitsyn. The first place in the exercise "Freight Handling" was taken by the Belarusian crew Vladimir Bugaev and Andrei Rogonov. Silver won the Russian crew Maxim Sotnikov and Oleg Puodzhukas. Bronze medal was won by Nikita Laptev and Vladislav Kurs (Belarus). On the exercise "Slalom" there were no equal to Maxim Sotnikov and Oleg Puodzhyukas (Russia). The silver prizes were Alexander Zhuperin and Nikolai Burov (Russia). The third place was taken by the crew consisting of Nikita Laptev and Vladislav Kurs (Belarus). In the junior category, Russian athletes did not perform. 1st place was won by Bartosz Konczalski (Poland), 2nd place by Medl Matias (Austria), 3rd place was taken by Oleg Baranovsky (Ukraine). Also in the past days off, places were taken in the final, the fourth stage of the World Cup in helicopter racing. In addition to the hosts of the competitions, crews from Austria, Great Britain, Germany, Poland, Russia and Ukraine fought for rating points. According to tradition, flights in the disciplines "Slalom" and "Cargo transportation" became the most spectacular part of the air battles, because unlike the world championship, where pilots are judged for inaccuracies, in the cup competitions the speed goes to the forefront. The heat of the fight is serious, and the audience watches with a sinking heart of the speedy performance of tasks. According to the decision taken at the beginning of the season, the competitions were held in two categories, depending on the level of training pilots - "Masters" and "General". In the final standings, the results of the two best stages of four were summed up - thus the World Cup holders were determined in "Masters" and "General". Once again, the Russians proved their superiority by fully occupying the entire pedestal in the "Masters" category, only with a minimal difference in glasses, losing gold in the "General" category. In general, in four categories of the World Cup in the disciplines "Slalom" and "Freight Handling" in two categories, Russian helicopter pilots won 14 gold, 12 silver, 12 bronze medals. In the «Masters" category the owners of the World Cup again, like last year, was the crew of Yuri Yablokov and Konstantin Podoynitsyn. The second place belongs to Maxim Sotnikov and Oleg Puodzhukas. The third place went to Victor Degtyar and Peter Vasilyev. Such results were predictable: for decades our pilots have demonstrated the coherence of work and honed flight skills. In the «General" category the winner was the Polish crew Marcin Shamborski - Michal Shamborski. Their main rivals from Russia, Sergei Tupikov and Alexei Pintelin were second. 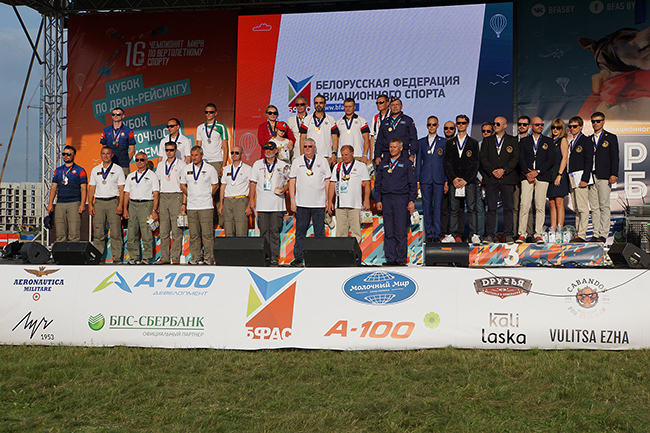 The third place among Belarusian pilots Vladimir Bugaev and Andrei Rogonov. In addition to individual credit, the Nations Cups in disciplines and all-around competitions were played. In the «General» category the first place was taken by Poland, the second by Russia, the third by Byelorussia. In the "Masters" category the seats were distributed in the following order: Russia, Belarus, Poland. It should be noted that, despite the stable leadership of the Russian team, the level of pilots from all countries is steadily increasing. Every year the professionalism of the participants grows, which makes the competitions more spectacular and hazardous. The level of organisation of aviation events is also growing. So Minsk, for the first time in 40 years taking helicopter competitions of such a high level, brilliantly coped with the task. However, for the aerodrome "Borovaya", unfortunately, the last championship was the last one - the ground closes forever. And yet the farewell to him turned out to be truly memorable and bright!